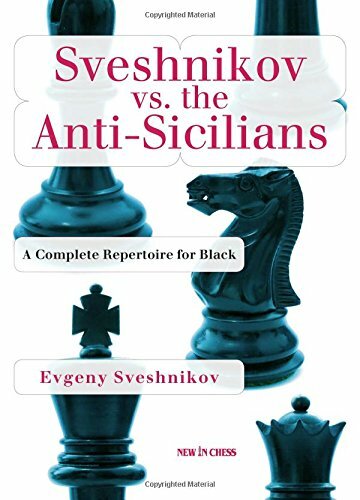 This book is intended for players who employ the Sicilian Defence (1.e4 c5) as Black, though it is not quite as comprehensive as the subtitle claims. It examines in some considerable detail every good, reasonable and halfway decent second move for White except 2.Nf3. To be clear, then, neither the Rossolimo Variation (2.Nf3 Nc6 3.Bb5), nor the Moscow Variation (2.Nf3 d6 3.Bb5+), nor for that matter the Wing Gambit in the form of 2.Nf3 d6 3.b4 (perhaps its optimal form, since here Black cannot go …d7-d5 in one move; whereas after 2.b4 cxb4 3,a3 d5! is a good response) are covered here. These systems (all anti-Sicilians as well, of course) may be the subject of a later volume; or so Sveshnikov intimates in the conclusion to this one. Most attention in the present book is given over to the Closed Variation (2.Nc3), though the Grand Prix Attack (2.f4), the Morra Gambit (2.d4 cxd4 3.c3) and Sveshnikov’s own specialism (Alapin’s 2.c3) are also allocated a fair amount of space. The outstanding feature of the book, though – and here the claim to comprehensiveness is justified – is that all White’s second moves are covered in a serious, that is to say in a principled and thorough manner. That is true even of such oddballs as 2.a3 Nc6 3.b4 (a kind of deferred Wing Gambit; 2.b4 is covered as well, of course), 2.c4 (a pet line of Normunds Miezis, apparently: I was unaware of the existence of either the move or the player before reading this book) and the non-descript (how else to describe it?) 2.d3. Sveshnikov shows no great love for Zviagintsev’s 2.Na3 because it both moves the knight away from the centre and deprives the e4 pawn of its natural defender (the knight belongs on c3, he believes) but even in this case he devotes some care to working out Black’s best response. The move is not simply dismissed. There are traps and tricks in many of these lines, here is one that is beautiful and fairly well-hidden. A few strong players have fallen for it, not least Sveshnikov himself. It goes: 1.e4 c5 2.Nc3 Nc6 3.Bb5 Nd4 4.Bc4 e6 5.Nge2 Nf6 6.O-O and now the principled advance 6…d5 looks straightforward and strong. What could be wrong with it? Well, it allows 7.exd5 exd5 8.Nxd5! winning at least a pawn. For after 8…Nxd5 9.Nxd4 cxd4 10.Qh5! Be6 (else White crashes through on f7 with a decisive attack) 11.Rel White wins back the piece. If 11…g6 12.Qxd5. If 11…Kd7 12.Bxd5. If 11…Be7 12.Rxe6 Nf6 13.Rxf6 exf6 14.Qxf7+ Kd7 15.d3 with a fatal encirclement. The Black king is simply too exposed after (say) Bf4 and Rel. Some 75 theoretically significant games are presented in full, with many featuring Sveshnikov. There are 36 exercises, involving positional and strategic questions as well as tactical puzzles, with full solutions to follow. Apart from one chapter – there are far better ways to meet the Morra than to adopt the remedies given here, in my view – I found Sveshnikov’s analyses impressive. Overall, Sveshnikov vs. the Anti-Sicilians is a quality opening repertoire book.